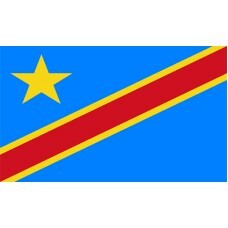 The Congo Democratic Republic flag features the colors, sky blue, yellow, and red. 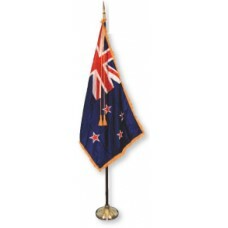 The background is sky blue and the flag includes a yellow star in the top left corner and a red diagonal band with a yellow frame going across it. The blue color of the flag signifies peace, the red color represents "the blood of the country's martyrs," and the yellow color symbolizes the wealth of the country. The star is significant for The Congo Democratic Republic's future. 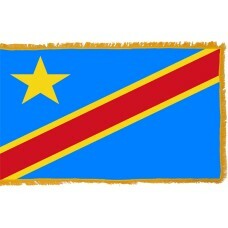 The Congo Democratic Republic Flag was officially adopted on February 20th, 2006. The flag used today originates from the flag that was used from 1963-1971, the only difference is the shade of blue being used. Between the years of 1877-1908, Congo was known as "Congo Free State." King Leopold II of Belgium became the leader of the Congo Free State. During the 1884-1885 Berlin West Africa conference, King Leopold made promises to make improvements to the country and to end slavery. Unfortunately, he was very corrupt, and in his attempts to make money and to make it a "civilised country," he exploited the people of Congo, forcing the citizenry into labor to harvest and process rubber. If anyone tried to rebel, King Leopold II's army (the "Force Publique" that consisted of African soldiers led by Europeans) would deal with matters with extreme measures including kidnapping the families of the men who were rebelling, burning villages, slaughtering families, and cutting off the hands of the citizens which even included children. It is estimated that 1,000,000–15,000,000 people lost their lives during the rule of King Leopold II. Their lives were lost either through sickness, fatigue, famish or murder at the hands of the Force Publique. Following the loss of lives, there was much international criticism and the Belgian government claimed the area from King Leopold II. After it was claimed by Belgium from 1908-1960, The Congo Democratic Republic became known as "Belgian Congo." During the years under the Belgian rule, conditions of the citizens were improved slightly but on June 30th, 1960, The Congo Democratic Republic became independent. Since it has gained independence, it has endured years of war and conflict. During the years that the country was called "Congo Free State," the flag used was dark blue with a large yellow star in the center. After gaining independence in 1960, 6 stars were added on the left-hand side of the flag. In 1963, the flag changed again to resemble the one that is used today, just a darker shade of blue and remained this way until 1971, when the country's name was changed to Zaire by dictator Mobutu SeseSeko. The country was known as Zaire until 1997 and Mobutu SeseSeko's defeat after which it became the Congo Democratic Republic. 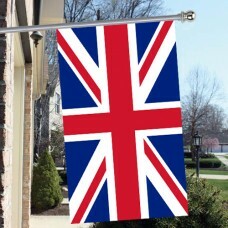 The flag has been changed three times between 1997-2006. The Congo Democratic Republic is the second largest country in Africa and shares borders with Angola, Burundi, Central African Republic, Rwanda, South Sudan, Tanzania, Uganda, Zambia, and the Republic of Congo. The Congo river that runs through this country is the second largest river in the world and is where the country's name was derived from. The largest and capital city is Kinshasa. The country's main attraction is Lola Ya Bonobo which is the only sanctuary in the world for orphaned Bonobos.